Ever get the feeling your office chair is more of a problem than a solution? Poorly designed office chairs have been blamed for decades of sore joints, backaches and headaches. A good chair is a big investment so make sure you have prepared your wish list before you shop. Adjustable enough to fit you and your working style. Comfortable for as many hours as you need it to be. Padded seats may be more desirable than mesh as padded seats offer a better distribution of weight. 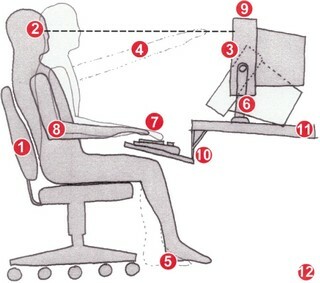 Good lumbar support which will fit your back. While there can be correlation between cost and benefit when it comes to office chairs that is not always the case. More expensive is not always better but you should be prepared to spend a couple hundred dollars on the right chair. Here is a great article from the Wall Street Journal that points out a few more pointers. Does Your Chair Have Your Back?